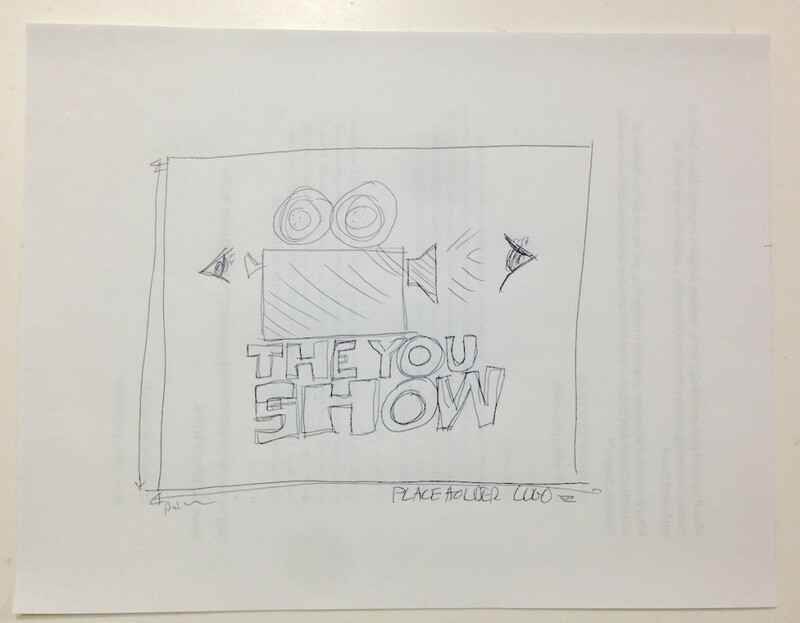 Now that our first video is on the front stage, let’s do this the You Show way and talk about the making of this video. Brian and I knew we were on a hurry up ramp to at least get a trailer video up so we could start promoting the site and the seminar. We initially thought about the motif of a movie review show, a la Siskel and Ebert. I came across a rather similar long run Australian At The Movies show with Margaret and Dave. The typical arguing movie experts. 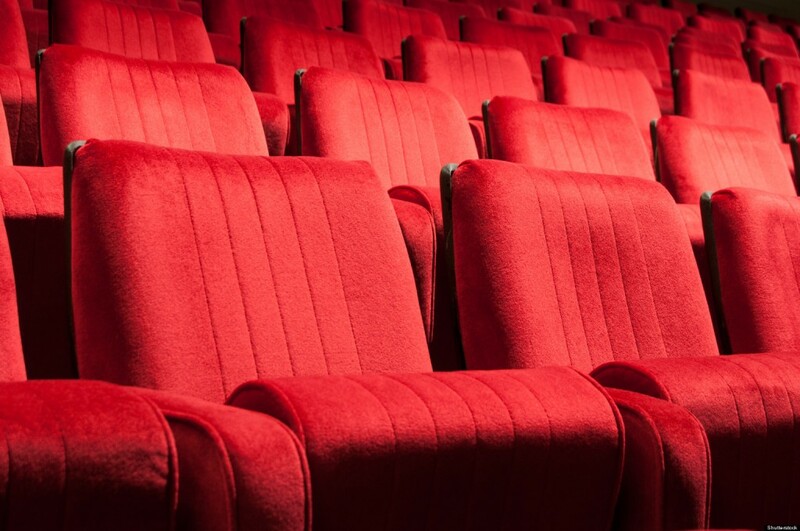 We even thought about filming in a classic style theater, plush red seats and all. There was some plans to get our TRU video expert John Fulton to help with videography, but as timing had it, he was out of town. And that actually served our purposes better. You see, I felt we did not want perfect video, we wanted guerrilla style, the kind people we were asking to join us would do, with super basic equipment. And I had a different thought- what if we could play off the idea of contrasting the show in front of the camera, with the technical behind the camera? 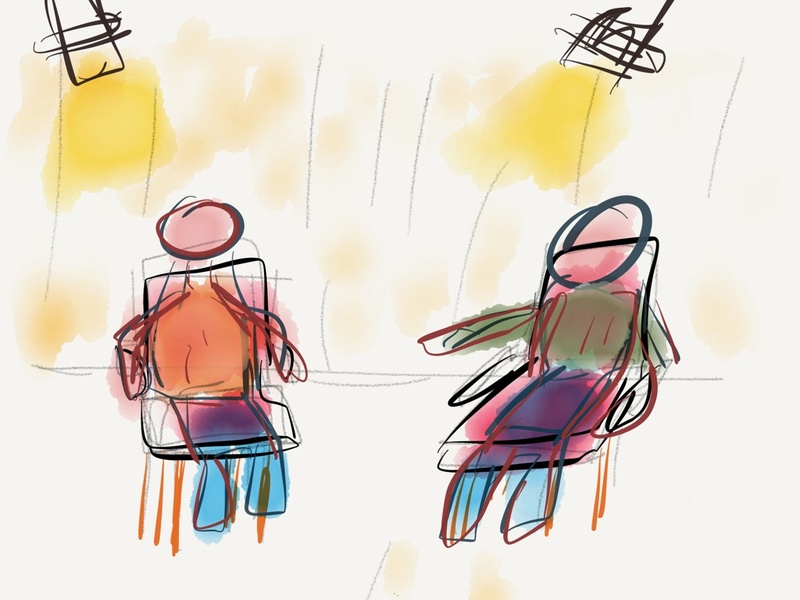 I even sketched it out using the Paper53 app on my ipad. It went like this- to play off of the “show” (e.g. on stage) and the “making of” (backstage). We then have a second sequence. viewed from off stage right at a sharp angle. Maybe we do a second camera from this viewpoint, blurred focus on us on stage,shallow depth of field just to show us in motion. We do the second filming of we are outfitted more like technicians, with headphones, clipboard, and we make commentary, talk more about the tech, media, web stuff. Comment on what the on stage personas are doing. Maybe its done on green screen so we can matte in the background of us on stage. 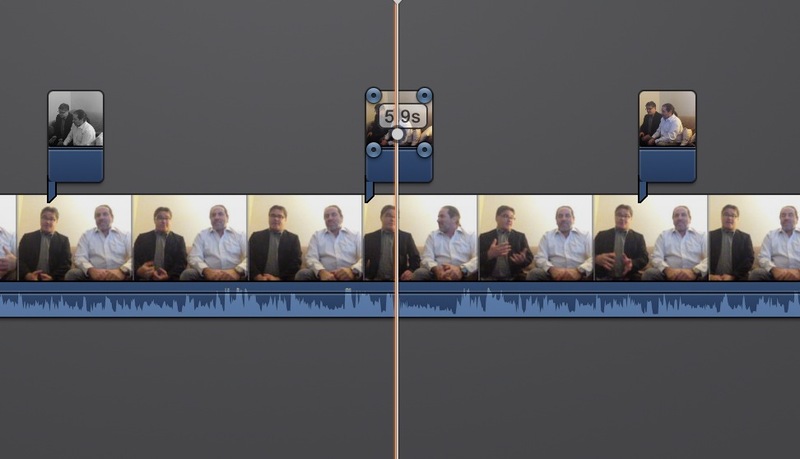 So the editing can be Sequence 1 as an intro, cut to us back stage for commentary, you can still hear the stage conversation going. And maybe close with us back on stage again. Since John was not around, and lacking green screen, I came up with another idea how we can film it in Brian’s apartment. We use his living room as the stage set, and do the backstage shot in a storage closet. Rather than merging films, I figured I could set up a laptop screen blank to look like a monitor, and I could use the Picture in Picture technique of iMovie to put the front stage video on a small screen. And one more idea popped in. For an opening sequence, I imagined a really sketched out version of a logo, maybe on paper. We do the opening sequence with just our audio talking about the graphics and talking about the cheesy background music. Play up the low budget angle. And we could do a similar intro every time, but with every episode the logo and music improve slightly, in conjunction with the kind of media topics we are covering (like the logo and colors get more clean when we do design). That was the idea. I actually did that part last after today’s filming, just by doing a sketchy drawing on the back of a piece of paper, filming it on my kitchen counter with my iPhone. I had the idea when we did our audio that Brian would ask if it could be in motion, so in my video, you see my hand come in and slide the paper. Low low budget. We made plans to do the video today at Brian’s place. In the morning, I drafted a general outline of the shots as a one page Google Doc, but it was not in any way scripted. I did all of the video capture with my iPad. 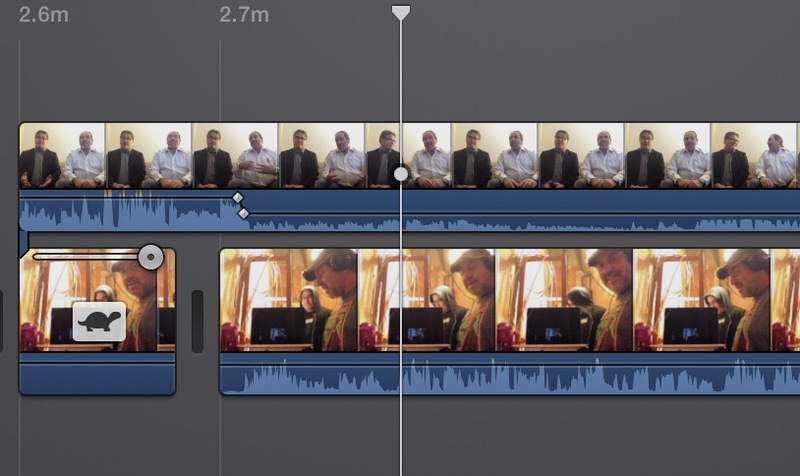 For better sound, I used a Samson Meteor mic, which can be used on the iPad using the Apple USB Camera adapter. We did the audio for the opening title sequence first (I use the Griffin iTalk app, there is a free version). It was done in one take. Actually everything we did today was one take. For the “stage” sequence, the iPad was setup on coffee table atop some books; I think I used the front camera so we could monitor it (I lapsed on not getting photos of the setup). To try and make the sequence more interesting, and the way shows do multicamera shots, I enlisted Brian’s son harry to do some short side angle shots of me and Brian as we filmed the main sequence. These are later edited in iMove as Cutaway shots; by lining up the video, it worked well to mix up the shots (I used a black and white filter, the iPhone footage was pretty rough once I zoomed in a bit). I also asked Harry to do the voice over for “quiet on the set” in the beginning. 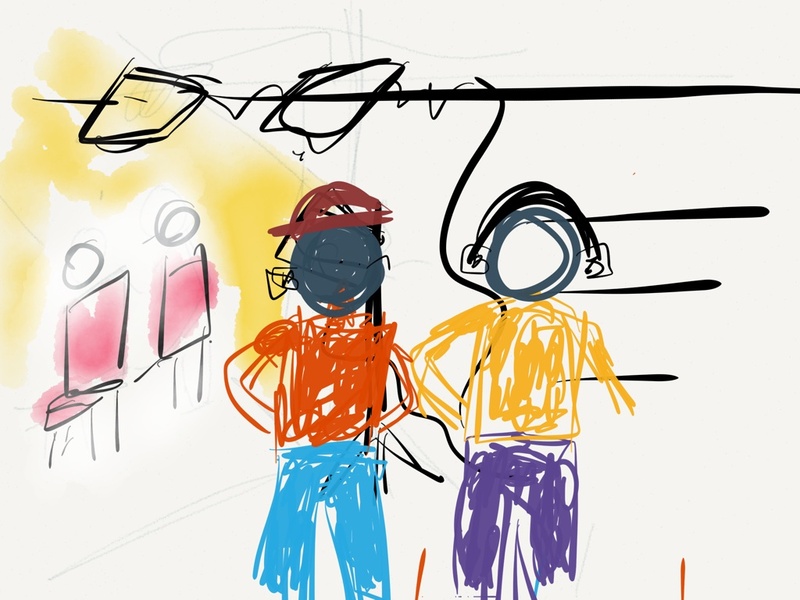 So we did the entire Stage sequence, I told Brian we would use about the first 3 minutes as footage, and the rest would be low audio background for the second segment, but we should just keep the sound of it going, and do a lot of gesturing, since we would be seen on the monitor by the Back Stage actors. We would then pick it up to do a closing, as the edit would return to the front stage. I asked Harry to try doing a backward pan to show the entire “set” was really a living room. 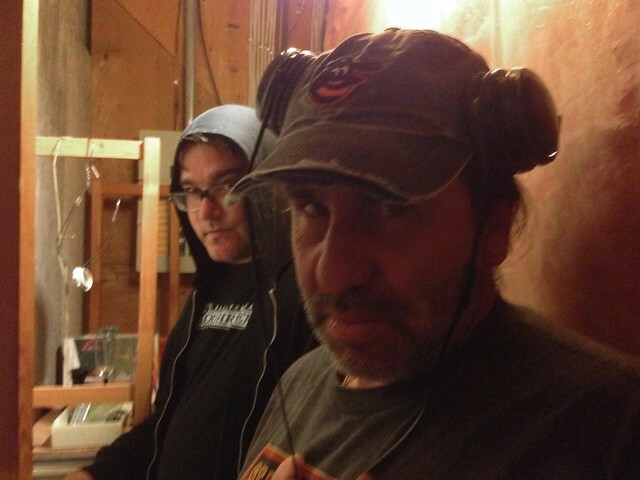 Brian and changed button downs for t-shirts, he put on his hoody, my my ball cap, so assume our roles as technicians. Harry loaned me his headphones. The utility room was really tight, but worked really well- there was an electric panel in the back, coiled wires, and dim light. I managed to set up my laptop in front to look like a monitor, and the whole set up mostly worked (except where I wave my hands in front of the screen). T had a short clip of the sketch on my counter, but when I added the audio, the clip was not long enough. I slowed it down (using the speed editor) to stretch it out. 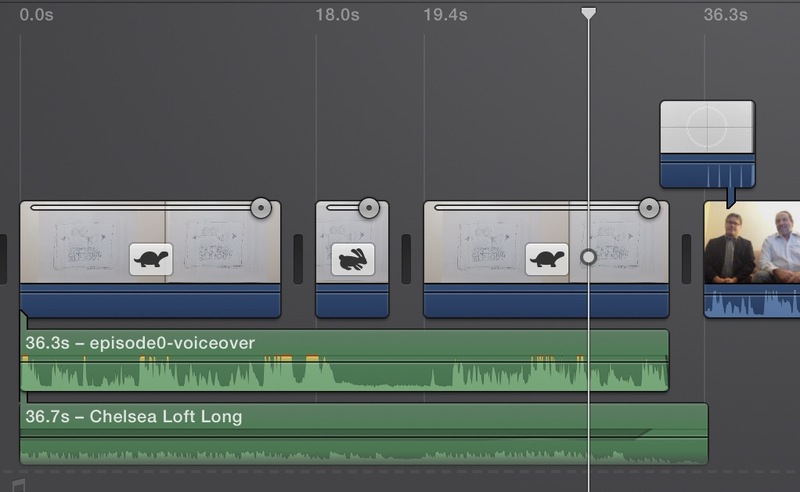 But the part where Brian asks if it can move did not line up, so I split the clip, and changed the timing on the second portion to better sync to the audio. I ended up making a copy of the firsts segment to fill in the rest. 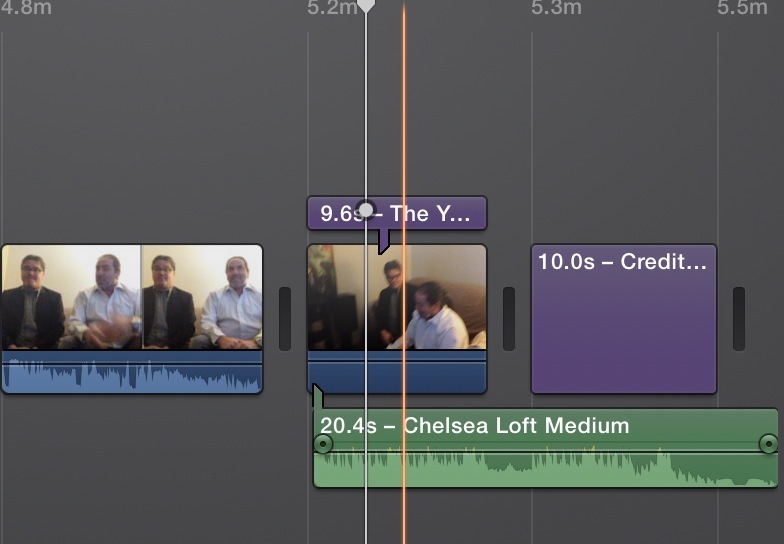 The audio is layered- the conversation of Brian and I with some stock audio from the iMovie library. I got fancy and added a little countdown clip to to pick up where Harry yells “3-2-1″. And I did a black and white effect to set the cutaways to look a bit different. I got fancy on one, where I flipped it horizontally as the video effect. Sadly you cannot use two filters, but there is another way to make it go black and while, just drop the saturation in the color editor. For the second scene, I put the tech crew in as primary video, and used copies of the primary clip as an overlay, using the picture in picture effect to size and place it over my laptop screen. I wanted the opening to be a continuation of the front stage scene, so I slid the main clip to the right, and inserted a copy of a middle sequence with no audio from the techs, so that the sound comes from the clip on the screen. When the dialogue starts between the two techs, I drop the audio levels of the front stage clip (I also put it in black and white). Then it cuts back to the front stage for the goodbyes. The closing pan video Harry shot on the iPhone became the background for the closing title sequence. I had never used that title style before “Pull Focus” which works well to blurb the background video and allow text to ride over it. I then filled in the same music as the intro, tossed in a credits sequence, and was done. It was then uploaded to YouTube. Quite a good effort for the first video, I think! These syndicated post are from blogging I am doing as part of the You Show open seminar project at TRU. I am syndicating just this category of posts I have authored. I am impressed and definitely want to see more of these videos and story board drawings. 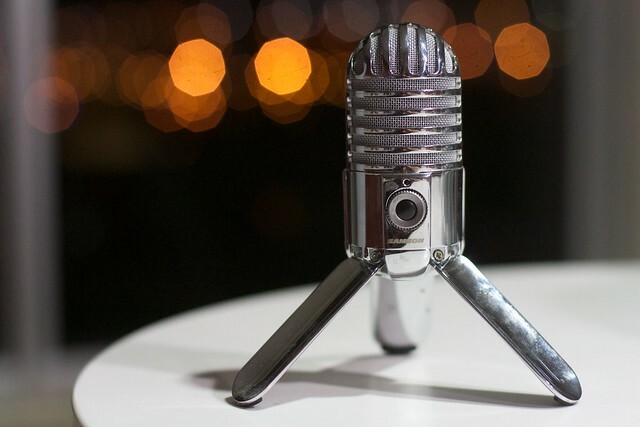 Just one thing, your nice picture of the meteor mic reminds me that mine takes down my computer whenever I try using it, what hurts a kind of, because it is a good mic. Looking forward to January the 12th. It’s grueling being on camera. That sure sounds like an opening to get Choconancy in the mix! How cool would that be? Alan, said this to you in person, but I am so grateful for the special brand of magic you are bringing. I love writing these pieces and have one I am working on about learning Premier for my video editing. I also want to get better at playing with puppets on mobile. Thst sounds fun and creepy. We had a fun recording session! Try Out / Please Break TRU Writer?